WebbySlot is a modern online establishment owned by SG International N.V. The online casino is licensed by Curaçao eGaming. The website is performed qualitatively and professionally. It has several language versions: English, Spanish, Russian. EUR, USD, RUB, AUD, NOK, SEK, PLN, CZK and several others. In addition to great design and wide choice of currencies, WebbySlot casino offers an extensive library of games consisting of more than 1000 positions. All the games are supplied by the popular software suppliers such as Netent, Microgaming, Amatic, PragmaticPlay, Betsoft, Evolution, Endorphina, Spinomenal, iSoftbet, GameArt, Habanero, Playson, Pariplay, WorldMatch, Mr.Sloty, etc. As for restricted territories, no customers will be accepted from the United States, Canada, United Kingdom, Spain, France and Italy. In addition to this, every provider has a list of countries where their games are unavailable. Users can choose 100 FS or 100% bonus for the first deposit. WebbySlot has a unique loyalty program. To get bonuses players should score tries. 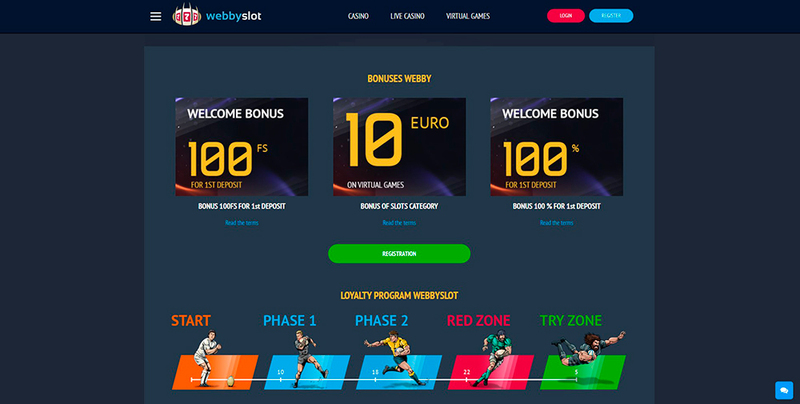 Webbyslot offers players a unique loyalty program inspired by Rugby. Here players should earn experience points (EP) = millimeters and to score a try, after which they get bonuses for passing key field marks. At WebbySlot live casino you can feel the atmosphere of a gambling house, observe dealer’s work, as well as actions of other players and communicate with them in a group chat. Live casino section includes such games as Blackjack, Baccarat, Dragon Tiger, Casino Hold'em, several types of Roulette. Professional support team of WebbySlot casino is ready to answer any your questions. You can easily get in touch with the representative of the online casino via 24/7 live chat, email or phone. To make any financial operation at WebbySlot, players can use banking cards, Skrill or Neteller payment systems, Paysafecard, Moneta, Qiwi, YandexMoney and others. As for withdrawals, they are limited to 20 EUR / 4000 EUR per transaction. Withdrawals are processed within 24 hours. 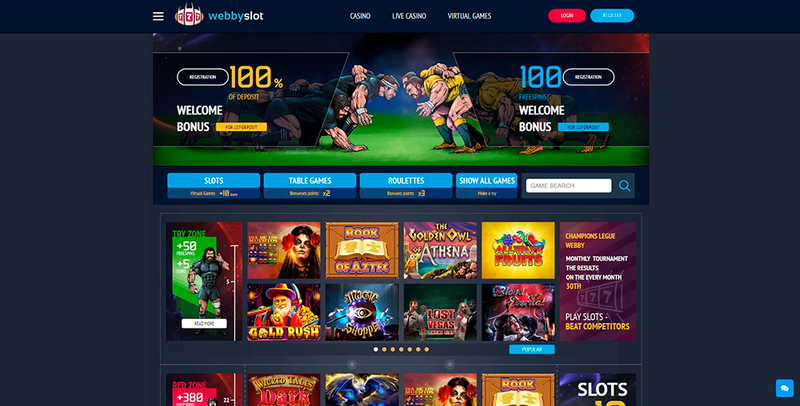 Webbyslot is an original advanced online casino, modern design and unusal bonus program. The project offers everything you need for comfortable play. It's a number of payment methods, wide choice of currencies, flexible bonus policy and friendly atmosphere. No less important that this is reliable casino. For new players, Webbyslot Casino is glad to offer First Deposit bonus 100% up to €200 or 100 free spins (by 20 free spins per day) in the provider Betsoft. At the time of registration in the casino you need to choose one of the bonuses. Min deposit - €20.